Daimonji-yama is a beautiful mountain with a summit at 466 meters above sea level which is located in the north east of the city of Kyoto. It is most famous for its Gozan Okuribi festival which is held on August 16th every year. On that night, 75 fires on Kyoto’s mountainsides form enormous Kanji characters in order to celebrate the end of the Obon Festival of the dead. Although Daimonji-yama is best known for this spectacular event, it can be accessed all year round and is a popular destination for walkers and hikers who want to explore Japan’s beautiful countryside. Travelers to Kyoto are recommended to take the short hike up the mountain, with trails that begin close to the Nanzen-ji temple and Ginkaku-ji Temple. 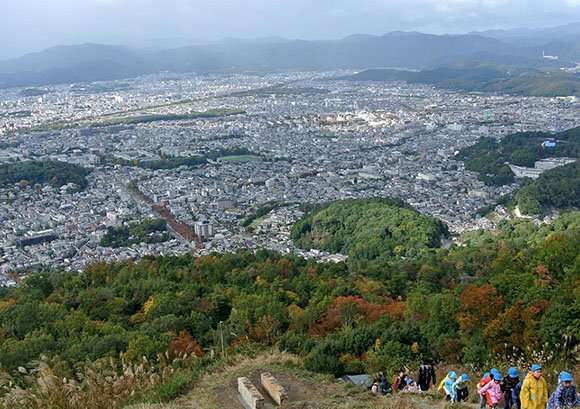 Even those who do not consider themselves to be especially fit, and those who are traveling with children can still often manage the climb which only takes around half an hour, and the view from the top over the city of Kyoto makes it all worth it. On a clear day, it’s possible to see the perpendicular avenues of the old capital all the way up to the station, with the temples and other points of interest clear to see.